We are happy to help you with any Hornor & Harrison men's clothing or accessory item returns or exchanges within 30 days of purchase or by January 15th if received during the Christmas/Holiday season. Returns and credits will be applied to the original purchasing credit card, if a request is made for an exchange that costs more than the original purchase the difference will be applied to the original card unless a check or another form of payment is included for the exchange. If you have a defective item please call 304-422-8271 and we will guide you on how to handle the return or replacement. Any items that had requested alterations done are non-returnable but we are happy to make further adjustments if needed. 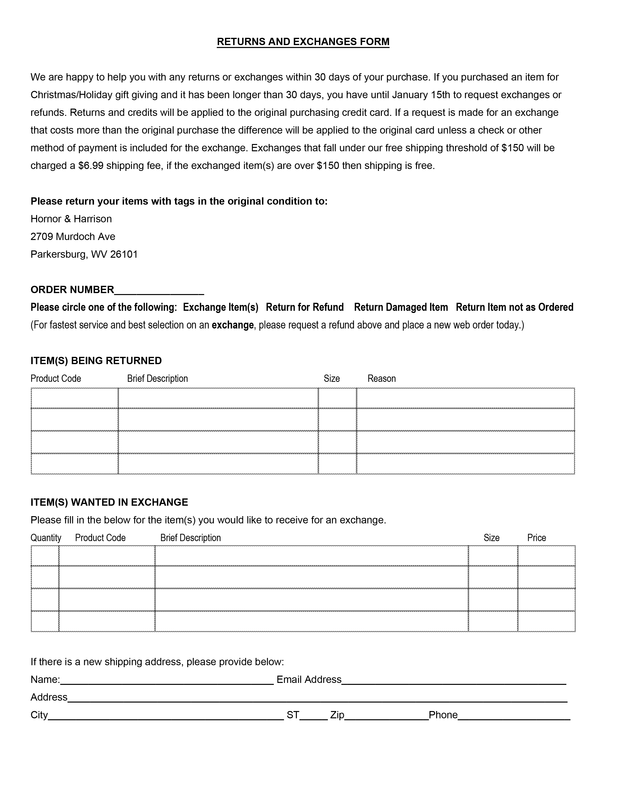 Returns Form (click to print). You should expect to receive your refund within two weeks of giving your package to the return shipper, however, in many cases you will receive a refund more quickly. This time period includes the transit time for us to receive your return from the shipper (3 to 5 business days), the time it takes us to process your return once we receive it (2 to 3 business days), and the time it takes your bank to process our refund request (3 to 5 business days). HH Men's Clothing offers FREE USPS/Priority Mail ground shipping on orders over $150.00 ($200.00 for Canada). There will be ground shipping charges of $6.99 ($10.00 for Canada) on orders up to $149.99. We are happy to air ship for you. After you add your men's clothing items to the shopping cart, choose the method of shipping and the cart will automatically figure your shipping costs. Hornor & Harrison uses UPS and USPS Priority Mail for shipments. Orders are normally shipped the following business day of the order and normal delivery time for ground shipments are 1-4 business days. Sometimes we are out of stock on an item and will have the manufacturer ship directly to you. You will be notified via email if this is the case. Air shipments are delivered by UPS, please note UPS will not deliver packages on Saturday unless Next Day Air Priority shipping is selected and the package is shipped on a Friday. Orders shipped on Thursday using UPS 2Day Air will arrive arrive Monday. If you need something shipped out the same day by next day air you should contact customer service of hhmensclothing by phone at 304-422-8271. If shipping to Alaska or Hawaii we will ship Priority Mail and you should expect to see your order arrive in 5-7 days. Free or reduced 3 Day Shipping does not apply to Alaska or Hawaii. When you place an order, you will receive a shipment notification email along with a tracking number once the order has shipped. If an item will be drop shipped directly from one of our manufacturers you will be notified by another email.